1 watch, 3 time zones, 4 materials. Titanium, ceramic and rubber: with the Patravi TravelTec FourX, time takes on a new material format. These selected materials, together with 18 K rose gold, make the latest watch creation from the Carl F. Bucherer Patravi collection a real talking point among watch enthusiasts. In the new Patravi TravelTec FourX model, the watchmakers at Carl F. Bucherer bring together not only different time zones but also different worlds – worlds of exquisite materials. Fine 18 K rose gold, paired with extra-hard hightech ceramic, which sets the highest standards in the timeconsuming process of forming the bezel. And high-quality titanium and highly resistant rubber also play their role in an extraordinary overall concept. For together, these four very different materials add yet another dimension to the fourth dimension of time: exclusivity. Movement and case integrated for the first time. The design of the Patravi TravelTec, which was first launched in 2006, created entirely new challenges for engineers, watchmakers and designers, since the specification required the clear and simultaneous indication of three time zones, necessitating for the first time ever the integration of movement and case. In the Patravi TravelTec, the case contains part of the time-zone selection mechanism, which is controlled in two directions by means of a single monopusher. The process can even be observed through a window that has been let into the side. For frequent fliers and globetrotters. The time and effort put into the design is very much aimed at ease of operation. For example, the direction of travel (east or west) can be pre-selected on the multifunctional monopusher at 10 o’clock and each push causes a jump to the next time zone, the flange with its imprinted 24-hour scale turning in either direction to guarantee that the red hours hand always shows the correct local time. 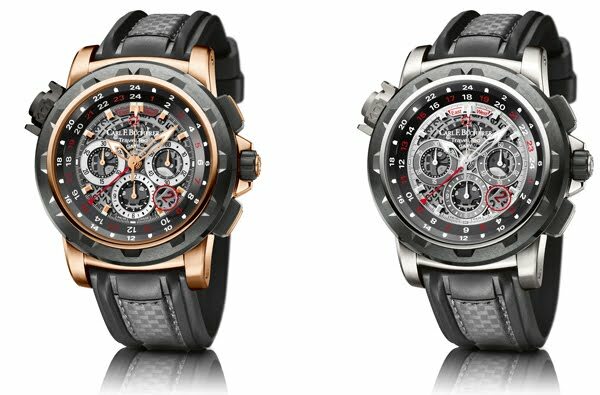 Unlike other “world time watches”, the Patravi TravelTec is suitable both for frequent flyers and for those who communicate with people all over the world. Those entering another time zone will prefer to make an adjustment at once, moving the wedge-shaped hours-hand forward or backward an hour at a time. Those who frequently need to make calls to other time zones will value the combination of the 24- hours hand and the patented Patravi TravelTec mechanism, with which the time zone of the person called can be selected and it can be seen at a glance whether it is day or night there. Luxury and high tech combined. As far as its “instrument look” is concerned, the Patravi TravelTec FourX has nothing to hide. For this reason, the watchmakers have given it a skeletonized dial permitting a free view of the gearing of the painstakingly decorated automatic movement. A visual delight is provided by the elegant date indication under an effective loupe: the figures are milled out of the date ring and remain invisible until they appear over a red background in the date window. With the new Patravi TravelTec FourX model, Carl F. Bucherer has created an additional highlight. Four different materials are used, forming a unique combination of luxury and high tech: 18 K rose gold, titanium, ceramic and rubber. The technical look of total visibility is enhanced by the coloring. Matt black contrasts with fine rose gold, while red emphasizes important information on the dial. Your journey through time can begin. Splendid engineering in the tiniest space – the Patravi TravelTec FourX from Carl F. Bucherer.